I have always wanted to make my own pasta. It just looks so easy and good when you see Martha Stewart do it by hand in less than 20 minutes, with no flour mess and not even breaking a sweat. I also love the idea of being able to give my family fresh food, not the packaged, preservative and unhealthy versions you find at the store. However, I must admit, when looking at the expensive equipment she uses, it seemed virtually impossible to be able to do it. 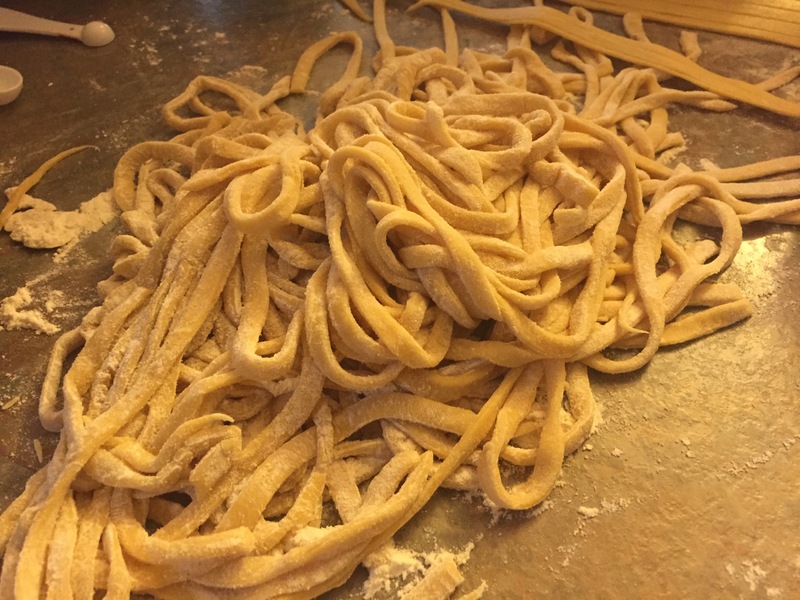 Plus, who has the time around here to make Fresh Homemade Pasta. I tend to shy away from hard or time consuming meals. I have a husband and 4 children to feed, plus my brother, so I gotta make a meal that is filling and will save me the cries and wines from the “Children Of Israel”, that they are starving! (as if I didn’t just slave in the kitchen to feed their hungry bellies less than 2 hrs ago). So, perhaps this one was going to be one of those “Living Vicariously Through Martha” dreams. You know….the meals you have made time and time again in your head, standing next to Martha in her spotless studio kitchen, while you both laugh and joke about the challenges of living life in the limelight – dream. Yeah…..
Then, this week I happened upon something neat in Target. 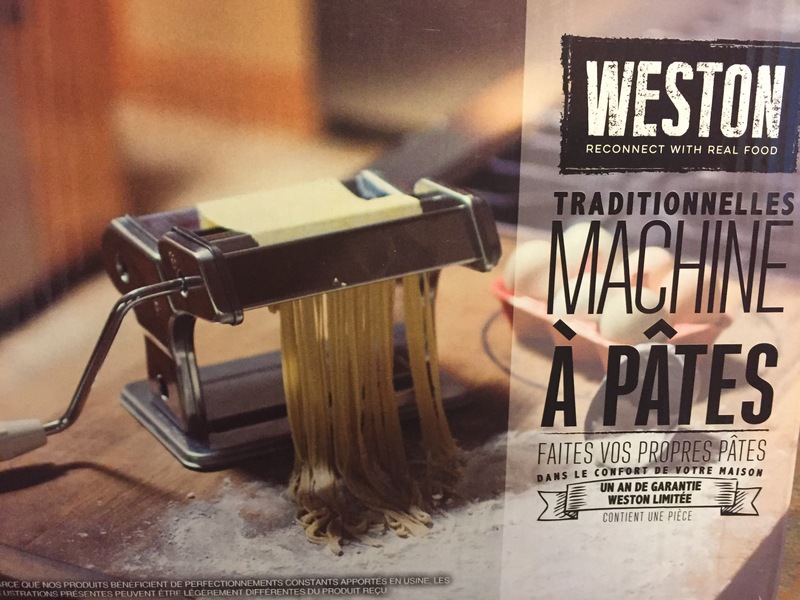 It was a Weston Traditional Style Pasta Machine. When I saw it I thought surely it would cost about $80. The ones that attached to the Kitchen Aid Stand Mixers are around $70 bucks or more (depending on where you purchase it). But this Weston was only $34. Then I thought, “Are you really going to make Pasta….FROM SCRATCH!!!“. My shopping buddy that day, my daughter Abigail, is usual my go to for keeping me grounded while shopping. She has a way of being able to tell me, “Mom….you know you are not going to use that!!”. Today, was no different and when she saw the look of “BUY or NOT TO BUY”, on my face, which can last any where from 2 minutes to an 20 minutes, she looked at me and said, “Mom….do it!”. So….I did it. 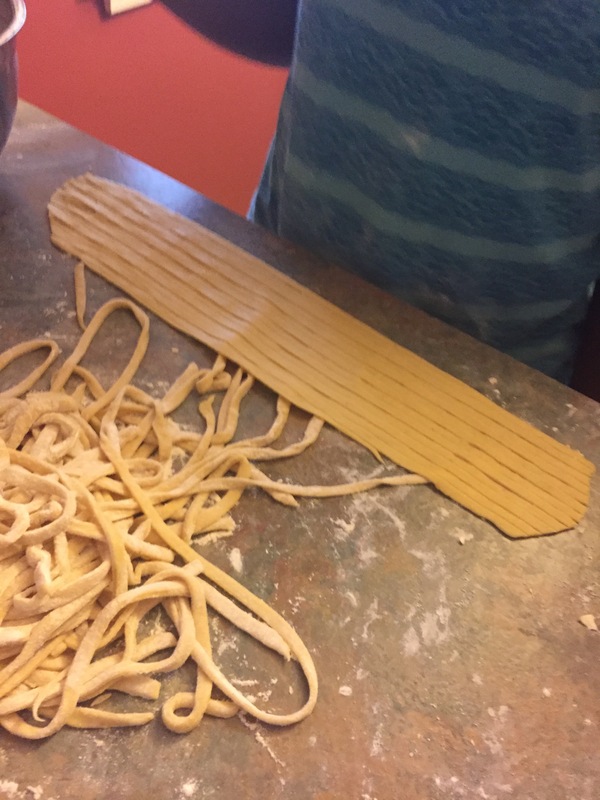 Today the kids and I tried it out, as we all made our first try and homemade pasta! Thank God for YOUTUBE, as we found a really good video that showed us the simple beginning techniques of making the dough. Then we tried the machine. The instructions were fairly easy, no real assembly required, as it was a manual machine you crank by hand. 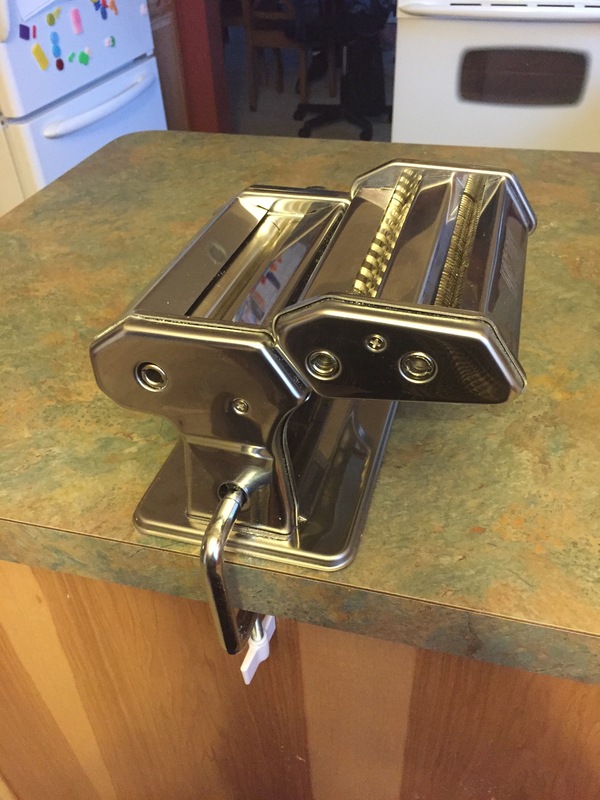 It fits into 3 different slots for making the pasta. 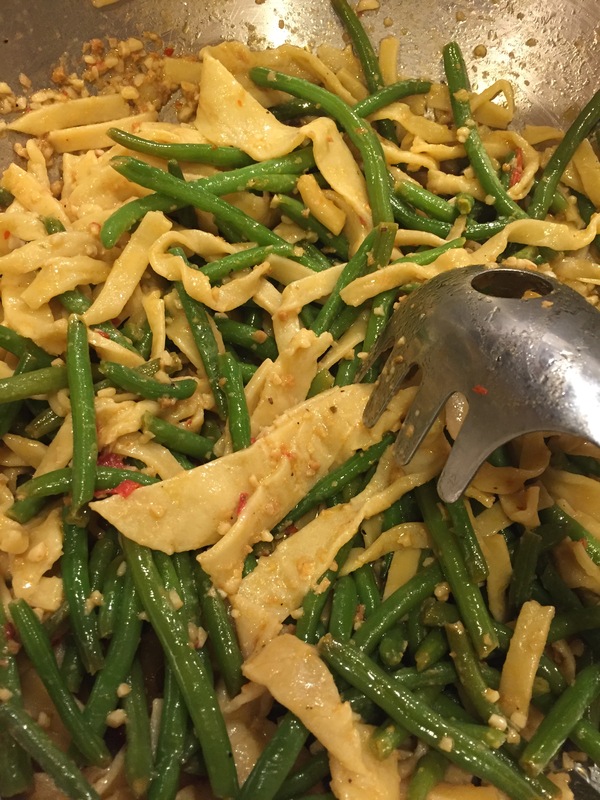 One slot flattens the pasta into sheets (offering several options for thinness). The two other slots are for cutting the sheets of dough into fettuccine, or regular spaghetti shapes. Pretty strait forward for the most part. Only thing I would recommend is taking your time with the dough. It took several times through the flattener portion of the machine with the dough before we found the right consistency that we needed for the Fettachini shape we were looking for. So, here was the end result!!! The noodles were a bit thick, but everyone Loved it! I sautéed some fresh unions, garlic, sundries tomatoes, green beans and olive oil in a pan. I took my fresh 2-4 minute cooked Pasta Noodles from the boiling water and added them straight to the saute mixture and cooked for a minute or two longer. The taste was AMAZING!!! It is different from eating regular pasta, as the textures are quite different. But, not so much that you can’t handle it. I will find it hard to go back to eating regular store bought pasta. I figured it was a fun thing for the kids and I to do together and we can try to incorporate more fresh pastas into our diet slowly. Premake and freeze is a good idea too. Our plan is to try and do ravioli, and make our own Bow Tie pasta next! Perhaps even try to incorporate flavors like basil, spinach and Beat! Mmmmmm. So, try out the Weston and see what you can come up with. It’s pretty sturdy, and easy to use…and most important…It doesn’t cost a car note to buy!